"Oil Contract of the Century"
Azerbaijan International's Editor, Betty Blair, interviews President Heydar Aliyev in New York, upon his first visit to the United States. Photo: Pirouz Khanlou. 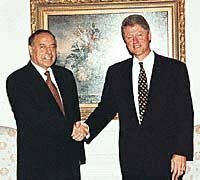 On September 30, 1994, Azerbaijan's President, Heydar Aliyev, gave an exclusive interview to Azerbaijan International's Executive Editor, Betty Blair. The interview took place in the President's Suite on the 30th floor of the UN Plaza Hotel in New York a few hours before the President flew back to Azerbaijan. Now that the Oil Contract has been signed and so many countries clearly have vested interests in Azerbaijan; and now that you've had the chance to meet with so many important world leaders, do you feel closer to a peaceful resolution of the Karabakh conflict that is acceptable to Azerbaijan? I'm very confident now, more than ever, that Azerbaijan is closer to achieving a peaceful resolution in its conflict with Armenia. My government's tireless efforts throughout this year and especially during these recent weeks have revolved around this issue of achieving a peaceful resolution. Our objective these days has been to be heard in the world community and to present a true picture of Azerbaijan Republic's difficult situation. At the same time we've wanted to create viable possibilities for achieving peace. In my recent meetings with the highest level officials of all these governments and corporations, I have emphasized the great desire of my people and the solid and clear position of the Azerbaijani Government, in putting an end to this conflict. President Aliyev meets with US President, Bill Clinton, for the first time. (New York, September 26, 1994). 1 Insistence on Armenia's entire armed forces being withdrawn from the occupied territories of Azerbaijan. 2 Return of more than a million Azerbaijan refugee citizens to their homes from which they have had to flee because of Armenian aggression. 3 Guarantee of Azerbaijan's independent sovereignty and territorial integrity. I was deeply impressed by President Clinton's serious attention to the question of Nagorno-Karabakh. He informed me that this conflict between Azerbaijan and Armenia was one of several important issues on his agenda for his upcoming meeting with President Yeltsin (Russia). Among other issues that we discussed together were the socio-political and economical relations between our two countries. Of course, we touched upon the importance of the Oil Contract signed in Azerbaijan on September 20th between the Western Oil Consortium and SOCAR (State Oil Company of the Azerbaijan Republic) as four of the nine companies are American. As you know, earlier he had sent a message of congratulations to me on this occasion, calling it "one of the largest such agreements in history". He was convinced that the Oil Contract along with a resolution to the conflict, in and around the Nagorno-Karabakh region, could play a major role in promoting stability, economic growth and prosperity for all the people of Azerbaijan. In other meetings this week with His Excellency UN Secretary-General, Boutros Gali, and the Foreign Ministers of England, France, Germany, Turkey and Iran, I directly and openly talked about the situation of our Republic which is being occupied by Armenia's aggression. I explained our position and the conditions under which we are willing to work for a peaceful resolution. I also emphasized the necessity of introducing international peace-keeping forces into the region. These troops should indeed include Russians as a resourceful and important neighbor of Azerbaijan. However, Russia's desire to single-handedly resolve this conflict would neither be correct, nor acceptable, to us as a solution. In my meeting with Jan Eliasson, Chair of the Minsk Group of CSCE (Conference on Security and Cooperation in Europe), we both agreed upon the necessity that the process of resolving this conflict must take place under the leadership of the Minsk Group in the context of the United Nations and the CSCE. My impression is that this position was welcomed and met with approval by most of these leaders with whom I met, including President Clinton. In addressing the 49th Session of the United Nations' General Assembly just yesterday, I emphasized and introduced the Foreign and Domestic policies of Azerbaijan Republic to the world community. Therefore, without a doubt, there is now much more understanding of Azerbaijan's status and perspective in the world's arena which is critical for its successful resolution. You must personally be very pleased about the signing of the Oil Contract especially since you've been so directly involved. It's a credit to you that the Contract was signed so quickly after the negotiators returned from Houston only a few weeks ago. However, there are still obstacles that must be overcome before the Contract becomes a reality. Specifically, there are problems related to the pipeline route, the "Status of the Caspian", and those individuals and nations which would wish to block the implementation of this agreement. It's been a tough road to finally achieve the contract that we now have in hand. It's taken three years of negotiations which have been interrupted by both internal as well as external factors. Mistakes have been made. There were times when Azerbaijan's national interests were not always sought after, nor satisfied. That's why I personally got involved in supervising the second round of talks by issuing a Presidential Decree. We wanted and, I believe, we have achieved a contract that is mutually beneficial to all parties. After all, Azerbaijan's national interests are directly linked to the success of this extremely important and historic agreement. I'm very pleased to say that we have finally overcome all the obstacles and difficulties to the historic signing of the contract; nevertheless, as you mentioned, brand new difficulties have arisen after the signing of the agreement. Chief among them are statements made by the Russian Government declaring the terms unacceptable because of the "unknown" status of the Caspian. Their resistance is common knowledge only through the media. I can only tell you that I do not consider that these statements will pose a serious problem. First of all, the contract already includes the Russian Oil company, Lukoil, as a beneficiary of 10% share of the deal (of a multi-billion dollar contract). Secondly, we signed an agreement between Russia and Azerbaijan in October 1993 making provision for the rights of oil in the Azerbaijan sections of the Caspian. As well, a representative from the Russian Energy Ministry, Mr. Stanislav Pugach, did sign this agreement on behalf of the Russian Government (on September 20th along with the rest of the signatories). Thirdly, there has never been an official statement by the government of Russia to the Azerbaijani government during or after the signing of this agreement. As I mentioned to President Clinton and the representatives of all oil companies involved, I don't see any validity to these reports and claims. We will go forward with the implementation of this agreement with no attention to these news reports. A provision in the Contract requires that no later than 54 months after the contract is signed that a pipeline must be ready to transport petroleum out of Azerbaijan. This is another difficulty. Various forces are pushing for different routes to be built. What we are concerned with is the economic efficiency and political stability and guarantee for the route. I would say that Turkey would be the best bet on both of these accounts. As I said, our task is not over with yet. We expect difficulties and problems along the way; however, we are determined to overcome any future problems and to move ahead full force to realize the implementation of this Contract. You were one of the top leaders in the world when there were two major superpowers and so you have vast political experience. You've just personally met with President Clinton who is a fairly young leader and who alone now heads what has become the single superpower in the world. What are your impressions of Bill Clinton, personally, and what is your feeling of his grasp of the issues that relate to Azerbaijan? Well, you know, it's not how old you are when it comes to politics and leadership. It's true that I've been in politics for a long time and I've seen it all from the inside out as part of the core leadership of a world superpower. Nevertheless, Bill Clinton is the elected President of the United States, and I have had the utmost respect for him ever since his election. I'll never forget his reply to my request for help when I was Speaker of Parliament of Nakhchivan. When he became President, I sent a Congratulatory Letter to him explaining the difficult situation that existed for us in the Autonomous Republic of Nakhchivan because of the Armenian blockade. Immediately, he organized a plane load of aid and sent it to us. I find Bill Clinton to be a highly experienced politician. He's extremely intelligent. He's a sympathetic person and concerned about other people's problems. That's why I find him credible and demanding of my respect. I see President Clinton as a friend and a partner who can help us a great deal in solving Azerbaijan's problems. All in all, I'd say that our meeting was very warm and productive. We understood each other very clearly. And he demonstrated a great interest in the information I gave him. It seemed to me that he accepted my proposals and suggestions for the issues that relate to our future. Thank you very much for taking time from your very hectic schedule here in New York to meet with us. Our staff at the magazine wishes you and the Azerbaijani people success and courage in the days ahead as these plans, which are the result of so much hard work and dedication, evolve into a reality that will lead to peace and prosperity in the region. And thank you for your deep interest in Azerbaijan and for your magazine, Azerbaijan International. This is the first time that a magazine of such high quality is being published about Azerbaijan in the United States. Never before in our history have we had such a fine journal devoted to Azerbaijan like Azerbaijan International. This is a magazine that you and your staff have created in good faith and I thank you for it. We need the people of Azerbaijan and others, like you, who love Azerbaijan, wherever they may be, to help us. There aren't enough of you in America and Europe who are committed to helping us. We are now at war with Armenia which has a very strong Diaspora and which publishes many articles, journals and magazines from their perspective. Azerbaijan has so little support. Therefore, people like you and your staff who have so much love towards Azerbaijan are doing something good not only for our country but for peace and justice in the region as well. I'm very appreciative of your efforts.